You’ll use around 7,400 words today. At least, that’s the average according to research. If you’re a marketer, some of those words may make their way into pages on your website and posts in your social networks. The words you choose matter. A lot. Even though we choose words thousands of times per day, don’t do it unconsciously. When our words have marketing goals, we must choose them carefully, deliberately, and with traffic in mind. Because some words have the power to increase traffic. Here’s a list of words that increase website traffic, both from search engines and social media and instructions for using them in your marketing. 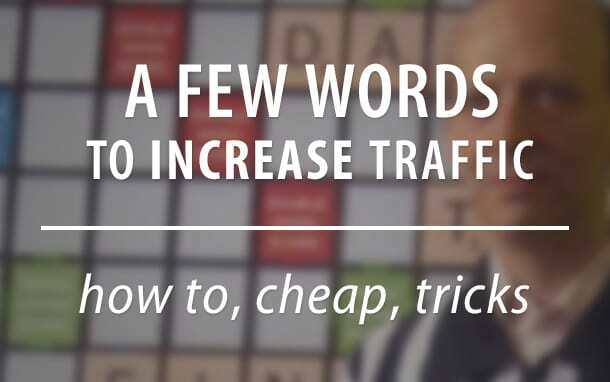 Which words attract visitors who are ready to buy? Search engines are used in all kinds of ways. But in marketing, there are really only two kinds of searchers and two kinds of keywords. It’s that second group that are ready to buy. If you can attract these visitors, they are more likely to take action than the first group. Targeting them isn’t difficult if you choose the right words for your webpages. Here’s a list of 84 keywords that are used by people who are ready to buy (originally published by CloudLiving). Combine these words with your topic to create target keyphrases. Next, use the Keyword Planner to see how many people are searching for the phrase. The phrase doesn’t appear in the Planner? That’s because fewer than 10 people per month are searching for it. Write the page anyway. Even if the phrase gets a low volume of searches, the few people who do search for it are very targeted and very likely to take action. Trust me, someone is searching for the phrase somewhere. If not today, soon. Make the writing on the new page very detailed. Your goal is to make the best page on the internet for the phrase. Follow SEO best practices when using the keywords and make sure to link to the new page from older pages. As Google evolves, search results are based less on specific phrases and based more on general meanings. This benefits websites that have sections of many pages relevant to the wider topic, all related and interlinked. Creating several pages using buyer keywords helps indicate that your site is relevant for the broader, semantic meaning. Which words get people to click? Ranking in search engines does not mean automatic traffic. People who search still have to click! 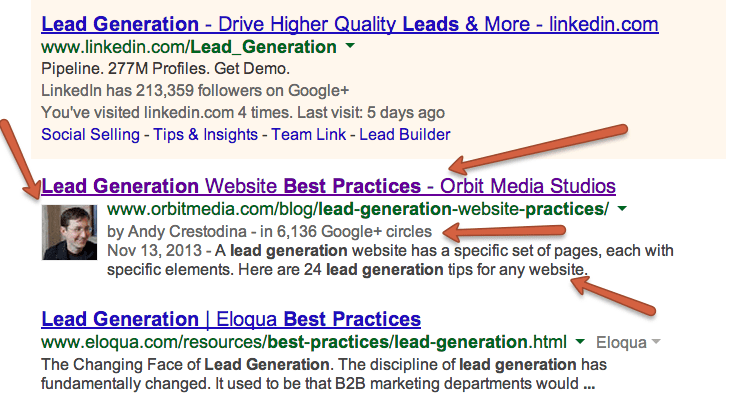 They decide to click (or not) based on the “snippet” or listing in the search results. Snippets are generally made up of a blue link with a few lines of black text below. Although there are all kinds of things that appear in snippets these days, in most cases the link is the title tag of the web page and the black text is the meta description of the page. The snippet either convinces them to click …or it does not. And the words matter. When Neil Patel analyzed 63 Google Webmaster Tools accounts, he found correlations between word choice and clickthrough rates. To improve click through rates from search engines to your website, use these words in your title tags and meta descriptions. PRO TIP: Remember, title tags should be no more than 55 characters in length and meta descriptions should be no longer than 155 characters. Use this content checklist if you need more help. Which headline words get people to share? Iris Shoor and her team analyzed 100 blogs and thousands of headlines to find which words generated the most sharing. Not surprisingly, she found that headlines with numbers get shared the most, especially when used as digits, not spelled with letters. Also, headlines with big numbers get shared more. The headline of this post is an example! Why? Because people have a natural bias to avoid loss, so negative words quickly grab our attention. 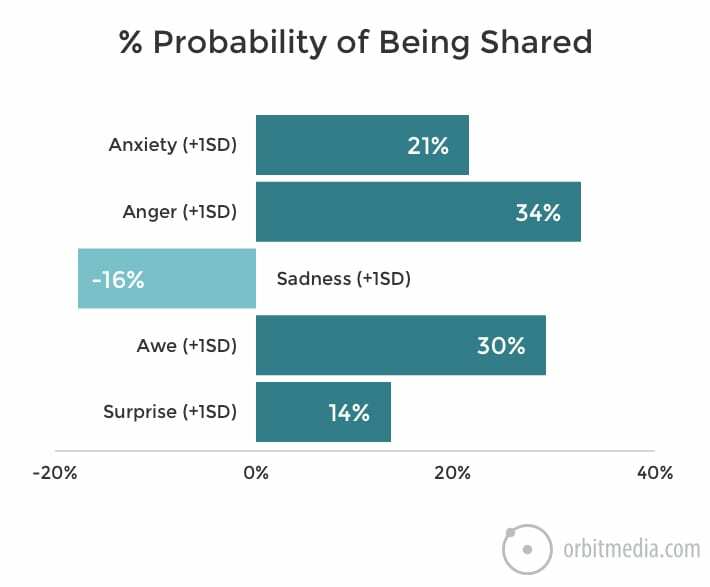 Using fear and loss aversion is a well-researched aspect of neuromarketing. Fear not! It’s not necessarily cynical to use negative words in marketing. It’s often just a way to empathize with your readers. Your audience has pain points and using words that describe their problems is a useful way to connect. Positive or negative, words that evoke strong emotions will be shared more often. Which words get people to retweet? Social media scientist Dan Zarella analyzed 10,000 tweets to discover the words that appear most often in re-tweets. He came up with the following list. These are the words that tend to get shared on Twitter. Notice the words “please” and “retweet” make this list at numbers three, four and eleven, showing the power of calls to action. Want people to share something? Ask them politely! Note: Zarella’s findings actually conflict with Shoor’s research. Takipi found that the words “you” and “how to” didn’t have an effect on sharing. But Zarella was researching Tweets and Shoor was researching headlines. Possibly, the ideal words for a tweet are not necessarily the ideal words for the actual headline on the page. Which subject line words get people to open emails? 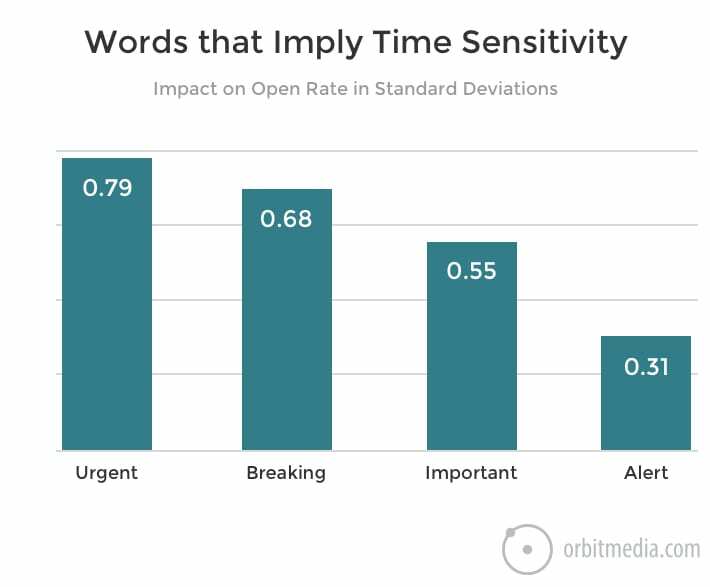 A recent MailChimp study analyzed the effect of word choice in subject lines on email open rates. The data covers personalization, capitalization and difference across industries. Just as emotions can be triggered by negative words, some words trigger the loss aversion bias in a different way. These words tell your subscribers that the information in the email is time sensitive and that by ignoring the email, they may miss out. If your email is relevant to the moment, let your subscribers know by using these words in the subject line. Bonus: Which words get people to buy? Ciotti recommends using these words carefully. Don’t just make everything on your site new, free, and instant. If you understand the psychology behind these words, you’ll inspire more of those new visitors to become leads, subscribers, followers, and customers. Recommended: Increase Blog Traffic by Nadya Khoja on Venngage. Really nice article, Thanks Andy. Happy to help, Tara! Every marketing writer knows it: words matter a LOT. So on-point, Andy. Another excellent piece of writing, and you clandestinely set yourself up to get a LOT of organic traffic to this post. LOL. Brilliant as always. Thanks! Thanks, Tim. Actually, I didn’t do much to optimize the title or header of this post, but there’s more to life than search engine rankings. Glad you liked this one. Of course, you’ve been carefully choosing words for years. Was any of this new to you? I’ve found that in some circumstances “official” is also a good word to get clicks. Nice composite of lots of research in one post. Helpful! Good catch, Matt. I wasn’t sure how to handle these so I just let it ride. “How to” didn’t surprise me, but the others were unexpected. If you try writing a headline with all 5 magical words, let me know! Great post Andy! I love to think about words and how they are used and organized! This article made me think more carefully about the words I used to describe “before and after” photos on my business Facebook page today. These would be great words to use on Facebook posts, especially the words that lead to more sharing. Thanks for the comment, Cindy! Andy, this is an excellent article and very thoroughly researched and organized. Thank you very much for sending.I have already forwarded it to a few clients! Nice to see you here, Michelle! And thank you for sharing it. I hope your clients take full advantage of the research. 131 words is a great start, @persado works with several million combinations. Wow! Thanks for this comprehensive list. I suppose if everything you send is “urgent,” the word may lose it’s effect. It’s like the little boy who cried wolf. Some of these are best saved for when there’s an actual wolf. There are probably 131 clever ways to cry wolf, but if you use them at the wrong time, you’ll lose trust with your audience. Wolf! …no wait, it was just a squirrel. I created a Newsletter and Email Subject Line swipe file. Whenever I’m stuck, I read subject lines and newsletters. It’s been a big help. Marketing Experiments once tested several headlines and concluded that the simple word “get” is powerful: http://www.marketingexperiments.com/marketing-optimization/optimizing-headlines.html. Also, the word “announcing” might be a good alternative to “new”. I can’t remember whether I’ve seen a test of its effectiveness. That’s great input, Henneke. I can imagine how “get” would work well. I also agree with your thoughts on the word “announcing” since it implies new. You don’t announce something after it’s been out for a while. It’s often the meaning, and not the specific word, that makes the difference. Thanks for your comment. Glad you liked this one! “Introducing” would work in the same way as “announcing” and is one I’ve been known to use from time to time. Love it, brilliant write up! Anglo-saxon words beat out the latin-based words for directness every time! It’s a great point, Vicky. I love the curt, almost percussive impact of these words. If this advice is included in your post, I’d love to read it. And thanks for the Churchill quote. What a great way to start my day. Ask and ye shall receive: my email about Winston Churchill and the power of a good old Anglo-Saxon word went out today. You can find it here: http://archive.aweber.com/sunflower-news/EvwGr/h/How_Winston_Churchill_can.htm. My next one will focus more on which words to use – and my research is what led me to your post (and onto your subscriber list). I’ll link back to you if you don’t mind, because your focus is slightly different from mine. Glad I gave you a great start to your day! TTFN. Brilliant post Andy – I agree that the key is using these words intelligently, and in the right places so they are read in context with your main content to increase traffic, shares, or whatever your objectives may be.. This post is the perfect complement to your Content Chemistry; the book tells you what to do, the other tells you how to do it. Thanks for the inspiring case study of top-shelf content marketing and writing. This means a lot coming from you, Roger. Thanks for the encouraging words. To the readers of this blog, I highly recommend checking out any of Roger’s content, including his books. Its a great piece outlining some essentials words to be included in headlines and descriptions of the articles. Plus these words also helps indicating the readers the content is written for. I usually try to use the word “You” so i can relate with my reader upfront and urge him to read what i have written exactly for him/her. I haven’t seen data on this. If come across anything, please let me know. And thanks, as always, for the comment! Great post. I find your stuff amazingly helpful. Thank you, Andy! I love this post, it’s so useful. I’ve copied sections of it into evernote! We can implement the suggestions in this article into our posts today. That’s the sign of an informative piece of writing. Andy, was this the post you mentioned on #BBSradio you were going to write? We love and appreciate your brilliance and making us think smarter. Yes! This is the post we talked about on your last podcast, Michele. I’m glad if the #BBSradio listeners find this useful! The 84 ready to buy keywords are perfect for entering into the KW Planner “Include” box. I’ve been looking to add to my list. These are wonderful. Thanks so much. Those words are also fun to check in Ubersuggest.org. Sometimes they match up with other words to make super specific, but non-competitive phrases. Thanks for posting such a very helpful post. I’ve used you’re list of keywords in creating title and formulating long tail keywords. It was really a big help! Another tip that greatly helps me in generating traffic is Responding to comments on the social accounts and engage with readers. Doing so increases the chance that they will come back and share the page with friend. Dear Andy, thanks for the list of useful words which can help us to drive traffic to our websites. The explanation is awsome. Thanks for your input, Kamal! Why not ? lot more to say good filtering Word of gems ! Real fact no denial true. Excellent, excellent article. I have to write about very technical regulatory topics for both informed and uninformed audiences. I realize now that I need to simplify the language for BOTH groups. The informed audience still needs the relevant information quickly, expressed in easily digested language. The fact that this post is still attracting comments, a year after it’s original publication, speaks volumes about the value of evergreen content…from selecting topics to execution. Lots of lessons to be learned. I’m glad you liked this one, Ravi! Hopefully you’ll find some other useful SEO posts here. Enjoy! I love it! Being totally new at online marketing, your article was exactly what I needed to get started. Thanks! Thanks, MaryAnne. If you look around, I hope you find a lot of other useful posts here. We’ve also written a book called “Content Chemistry” which is sort of a round up of the best content from this blog. Will be incorporating this into my website shortly, thanks for the research! 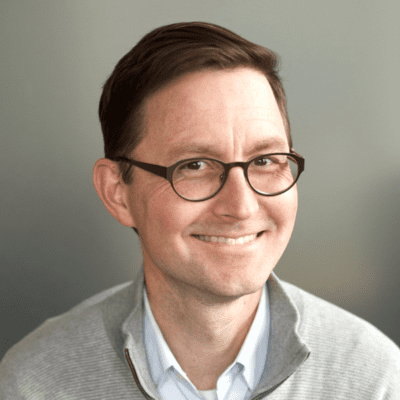 Great advice – taking notes! I saved it to share with my writing staff. Will you follow up with a similar list specific for B2B websites? Reminded me of an awe-some book titled “words that sell”. Have you read? I used to build my ad copies around that book. Few here I hadn’t thought of, thanks much I love these types of articles!! Excellent work. “Andy” and “Crestodina” words that ALWAYS get me to click! Ha! Those are the top 2 on my list, too. Thank you so much for this article. Extremely helpful! Definitely bookmarking this one. Thanks for great tips (as always) Andy! I keep coming back to this guide – it’s so good! Great work, Andy! Such a helpful post! Printed it out and ready to refer to! Low price web development company for more information.